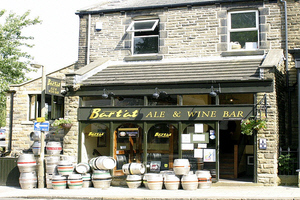 Situated just off The Grove, Ilkley's premier shopping street. The interior features Yorkshire dialect extracts from the famous song. The premises comprise an intimate ground floor bar linked via a spiral staircase to a non-smoking "cellar". There is also a patio to the rear of the premises for summer outdoor drinking. Food is served every lunchtime from 12 noon to 2.30pm and evenings between 6pm and 9pm. The chef produces top quality food from the small kitchen. Speciality nights such as Big Steak Nights on Wednesdays and Curry Nights on Thursdays are a feature. All wood and iron inside, this bar is friendly, though prices are not cheap.